The SDP-2 Stage Piano by Gear4Music is the perfect starter kit for anyone looking to learn how to play a digital piano. Not only does it include a great 88-key digital piano, but also stereo headphones, a bench, stand, and sustain pedal. This is pretty much everything you could need to get started playing keyboard. The stand and bench allow for comfortable practice at home, while the headphones give the benefit of practising in silence, which most beginners will come to appreciate. The inclusion of the sustain pedal is a great addition too. While someone learning to play may not need this initially, the ability to use the pedal for increased expression is something that will eventually become very useful for new players. Moreover, you don’t need to use the SDP-2 with the included stand. It’s easy to remove, and the lightweight and compact design make it simple to travel with. This is a must for beginners, as being able to take your keyboard to school, lessons, and practice is a huge benefit – nothing puts you off from learning than needing to humph around a heavy keyboard! Another important feature for beginners is to have a full range of keys. The SDP-2 comes with an 88-key design, allowing beginners to come to grips with a full keyboard from the offset. While some feel it’s easier to teach on a 61-key digital piano when starting out, it’s better to experience a full range of keys as soon as possible, as it won’t limit your playing ability and technique. This may even be suitable for experienced players. For example, if you only play on an acoustic piano, having an affordable 88-key digital piano is a good way to improve your technique from the comfort of home. What’s more, the 88-keys are weighted, which helps to give the touch and feel of an acoustic piano. Weighted keys are great for beginners, as it means you can feel how weighted keys make a difference, including pressing hard on higher registers and softer on lower registers. Anyone that wants to eventually play classic music on an acoustic piano will only benefit from using a keyboard with weighted keys like with the SDP-2. In terms of sound, the overall quality of the SDP-2 is quite impressive, being played through four integrated speakers. There are eight tones to play around with, and each one is rich and smooth, namely with the two acoustic piano tones. Beyond this, you some standard sounds, including two electric pianos, two organs (rock and church style), along with a vibraphone and harpsicord. These tones allow for a wide range of musical styles to be played on the SDP-2, which is great for beginners looking to play around with different styles. Additionally, there is a chorus and reverb effect that produces a quality sound not unlike those found in live venues. Outputs included with the SDP-2 allow the keyboard to become quite versatile. For instance, it’s possible to connect to a mixer or amplifier with the stereo output, while the headphone output lets you practice in peace -and the headphones are included with the keyboard! Furthermore, the USB output means the SDP-2 connects to computers. This is quite a good feature for anyone looking for a MIDI controller, as the SDP-2 is very affordable and lightweight, making it ideal for recording, whether at home or a studio. This also lets you record any performance from the SDP-2, which is certainly useful for beginner’s, as they can play back their performances for taking notes, while also learning how to edit music on a computer – great for any burgeoning producers! The SDP-2 Stage Piano by Gear5Music is an excellent digital piano for beginners. Not only does it have an 88 fully weight keyboard, but also a host of accessories that are perfect for getting started with. 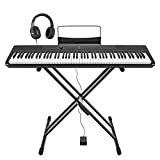 It’s a great model for using at home and using on the move, whether going to lessons or rehearsals, and the overall sound quality and selection of tones make it fine first-time keyboard. Plus, it’s got a very reasonable price, especially for all the accessories that are included!